Over the past two seasons, volleyball has dominated its home court and swept the George Washington Invitational twice — dropping only four sets in six games. This weekend, that imposing presence couldn’t be found on the court. On Friday night, the Colonials’ offense was lacking in their first game against James Madison. They swung only .080 percent in the first set and couldn’t get the momentum back, losing to the Dukes 3–1. GW came out slow again Saturday afternoon. They fell 3–1 to Northern Illinois in the second game of the tournament. Head coach Amanda Ault said she was disappointed with the team’s mindset going into the match. And in the third game, the Colonials were still never able to take control. On Saturday night, Tennessee cruised to a 3–0 victory, taking the sets 25–22, 25–17 and 27–25, forcing GW to drop to a 0–3 record at home. After the game, Ault said she was satisfied with the players’ mental toughness but did not think her team was playing to their potential. At particular times during each match-up, both effort and execution combined for strong performances from Colonials. 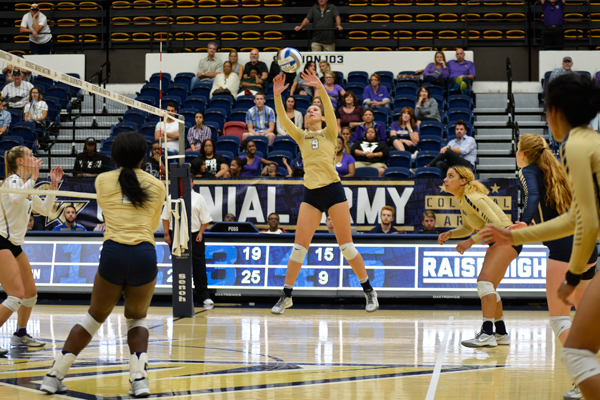 In the first game, the GW attack swung into 23 errors and only was able to block 4 shots, compared to the Dukes’ 10. Despite the struggles, the game remained close because of the Colonials’ back-line defense. Senior defensive specialist Maddie Brown (24), sophomore outside hitter Kelsey Clark (15) and senior setter Emily Clemens (8) combined for 47 digs and only garnered two errors receiving the serve. Associate Head Coach Erin Moore said the team is still hitting its stride. In the second game of the weekend, after dropping both of the first two sets to Northern Illinois, GW found its rhythm in the third set and took control. Even though the Huskies were able to bounce back and take the match after the fourth set, the 17–5 stretch at the beginning and the 25–15 finish was a glimmer of hope in the middle of a rough weekend for the Colonials. During the set, junior Aaliya Davidson and senior Loren Williams, both outside hitters, led the way going nine for 10 on attempts and recording six combined digs. “In that third set we went out there with more of an attitude of we are not going to let this happen, we are going to be the aggressor, and you can see it in the results,” Ault said. In the final set against Tennessee and the eventual final set of the tournament, the Colonials did not give up. After trailing 14–9, with the game seemingly over, a rally notched the score up at 25. GW had the momentum and energy, but an attack error at the net and a kill by a Volunteer outside hitter quickly shut down any last hope. In all three of the games senior middle blocker Chidima Osuchukwu was the go-to weapon for the Colonials. The Atlantic 10 first teamer finished with a team-high 46.5 total points on the weekend and was the only player on the team to swing above .300 against James Madison. Osuchukwu and other veterans said they want to correct the team’s mindset and build upon their small bursts of success. On Friday the Colonials return to action and kick off their Atlantic 10 play against Dayton on the road.